Hugh Merritt is searching for his wife's family's 1979 Ford-150 pickup. Hugh Merritt didn’t know what to do to help his wife, Emily, during this sad time. “Emily is heartbroken about her pappy,” Merritt told the Free Press. Emily made headlines when she was born during a snowstorm in January 1982 on the side of Interstate 70 in a red 1979 Ford F-150 pickup. Her parents, Leonard and Marilyn Orr, were racing to the Ohio Valley Medical Center in Wheeling, West Virginia. For years afterward, that pickup was part of every family outing. The truck represents a joyful time now lost. No one expected Leonard Orr to die at age 60. Celebrating the remission of pancreatic cancer in March 2018, Orr, of New Philadelphia, Ohio, succumbed to kidney cancer on Sept. 18. It stunned the family. And now Merritt, 43, of Moravian Falls, North Carolina, is on a quest to track down the old pickup in hopes of soothing his wife. He has issued a plea on social media asking people to spread the word and help. Merritt offers a single clue in the F-150 search: The truck has a bug shield decorated with a picture of a bear on roller skates. That’s it. He doesn't know the vehicle identification number. People pretty much just wish him luck, realizing the odds for success are grim. Here’s what else he knows: The second-to-last owner was Leonard Warner of rural Uhrichsville, Ohio, an Army platoon sergeant who served in the Gulf War, who traded it to a Honda dealership in New Philadelphia, which in turn sold it to a classic car restorer from somewhere in the South, according to the Times-Reporter in New Philadelphia. Warner said he had a chance encounter more than 20 years ago with the truck outside a parts store in Uhrichsville, he told the Times-Reporter. He spoke with the owner, but didn't have a reason to get contact information. Warner told the Free Press on Friday that he has since moved from his home of 27 years to a more rural area to be closer to his grandkids. He plans to go through his moving boxes to try and find a VIN number or a way to track down the truck. “That was an awesome truck. I sure wish I hadn’t sold it,” said Warner, 75, who is retired from coal mining and maintenance work. 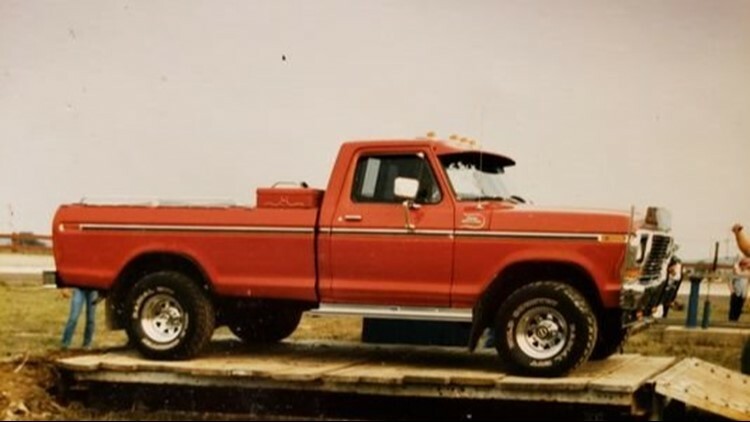 Ford sold 718,158 F-Series trucks in 1979. It was the nation's bestselling pickup 37 years ago and it remains America's most popular truck today. Merritt squeezed an interview into his day after working at Tyson Foods where, he said, “I do chicken all day long.” His wife is a college nursing instructor, teaching online and in the classroom. As Hugh and Emily Orr approach their first wedding anniversary on Dec. 26, they realize now they had no idea how life could change so quickly. But they're managing. And if anyone believes in miracles, it's these two. The couple fell in love over the internet. Each had bariatric surgery and went to a dating site specializing in the topic. “It was one of those cheesy free ones. We tried Match.com and all the others and nothing seemed to work,” Hugh Merritt said. “The day before my birthday, I got a message from Emily. She said she worked online at a college and had a degree. But she would send pictures and they were always sideways. I thought, ‘How can she always get pictures wrong if she works on the internet? We’re going to meet and this woman is going to steal my kidney. I’m going to get catfished.'" She stole his heart instead. Emily Orr lived in North Carolina. Hugh Merritt lived in Texas. He wanted to be sure she was as "nerdy" as he was, so he invited her to meet at the Johnson Space Center in Houston.